This is a fairly common card, a Haynes Distributing Company issue out of Roanoke VA. Chrome, of course. Plate number is 45031-B. 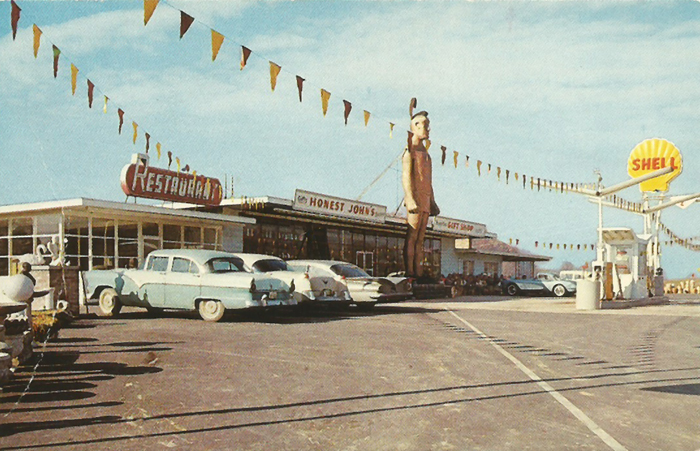 As far as known, it is the world’s largest wooden Indian. Built by Honest John. There’s interesting information on this indian here. Pratt’s bought the building in 1971. I am told that when this statue was in its original location on Memorial Boulevard (the old Bristol Highway, about halfway up to Edens Ridge), Honest John (Barker) had a loudspeaker installed in it. He would use an attached amplifier and microphone to issue cheery greetings to tourists passing by. This entry was posted in Bob's photos and tagged Big Indian, Haynes Distributing Company, Pratt's, Roanoke VA, Route 11W, Stone Drive Super Hiway on August 16, 2014 by Bob Lawrence.